Orsolya Szabó: Can you please introduce yourself? Monika Błaszczak: My name is Monika Błaszczak, I am from Poland. Before my EVS I was living in Warsaw. After my EVS I was trying to get a job in some NGOs but it was impossible, so I went back to my carrier in the business field. I was born in the North-West of Poland in a very small town. O.Sz. : Were you active as a volunteer already during your school years in a school union or organization? M.B. : Yes, when I was in my secondary school I started to participate in many actions. 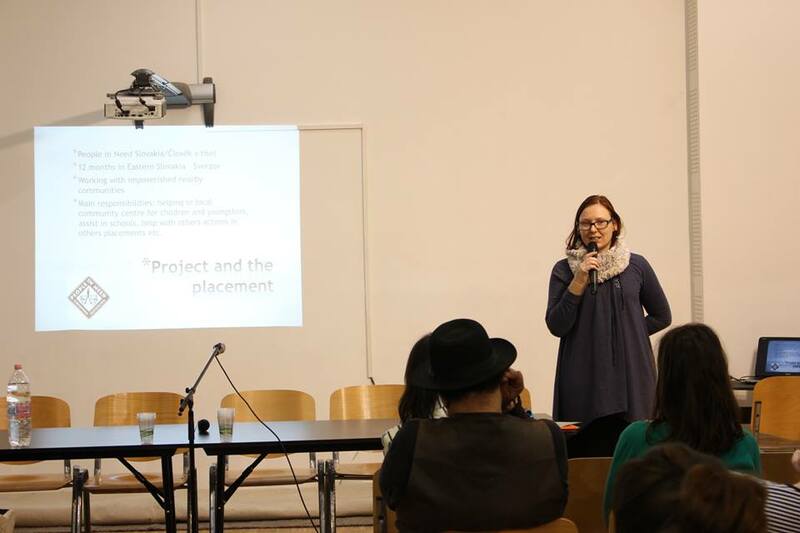 My middle sister was involved in the work of one of the nicest NGOs in Olsztyn – Borussia, and the aim of this organization is to work in the subjects of reconciliation between Polish and Germans. So I was involved in such projects. We were tidying up old cemeteries, or helping children from the poor communities in the villages. So I was very active in that during my whole secondary school. Later I was also sometimes a facilitator or trainer. O.Sz. : Can you tell me what this specific experience of volunteering in your local community meant for you that time? Why did you join that organization? M.B. : It was a very nice opportunity to learn something new. My parents are not very rich, so if I wanted to have an opportunity to practice my English or to learn something more about the region, this was the best way, to participate. On the other hand I am raised in a way that maybe we are not in the best position in life but there are always some people who don`t have so much and we should care about them. I think it is rather connected to the religion. Even though my parents and I are not strong believers we still share this ethics that you always have to remember that there are some people who have less than you. O.Sz. : And what motivated you when you decided to do EVS (European Voluntary Service)? Was it the people or the place, or why did you chose to go to a small village in Slovakia? M.B. : I wanted to do something that will be also meaningful for local community. When I was searching for EVS opportunities, I was thinking that it could be an opportunity to see really nice foreign countries, but on the other hand I am a very active person, so I had to have a place where I can act! Slovakia was the best place for me because the language is quite near to Polish and I felt that is good to work there for the Roma minority. O.Sz. : You mentioned that you chose this specific work because you want to make a change that is visible. Can you specify, what does this change mean for you? M.B. : It’s very simple. One of my responsibilities during my voluntary service was helping children to do their homework, and for me it is very important because those children don`t know how to learn and that is basically the problem. So for me it was some kind of a mission to teach them to learn the easiest and the quickest way. For me it was very important to show them that going to school and sitting at lessons or reading a book, or using a dictionary can be really fun. O.Sz. : How did the children accept you as a foreigner? M.B. : It was quite easy because the community center was very good and the local community have legal houses and the mayor of the village is trying to help them. It’s really like the model situation. There were two other community centers I was going to as well. It started very easy, we were playing, talking, and I am quite fit, so I ran with them, played football, volley ball and so on. It’s normal, children like you if you play with them. O.Sz. : Can you remember which kind of activities moved the most those local Roma children and young people ? Which were the most successful activities that you have done or organized? M.B. : It’s not about what type of activity you do with them. It’s about being systematic and being honest. When you are doing the puzzles or doing the homework or play volleyball with them there is always a possibility to talk to each other, to make some jokes with the children. You have to be with them and they will of course many times make you angry or happy or sad but these are normal emotions. O.Sz. : Did you do activities regarding history or the Roma holocaust? M.B. : Yes. I read a book, edited by an organization from Bratislava – Nadácia Milana Šimečku, on Roma survivors of the Holocaust. Then I started to ask questions, I was thinking about this group of youngsters. What can we do? How I can make it interesting for them? So, we screened films, we were reading the book for a group of children and adults from the community and the nearby settlements. And the people started to ask questions about the Holocaust and they found out that before the Second World War there was a Jewish shop in the place of the community center where we were working. And near the settlement in Petrova there is a place called Jewish Forest. We found the place and found the old tombs there. We also wrote a project for our Roma children and other children to clean up this cemetery but we didn`t receive the money for that. So, the Roma community showed me this place, and they were involved, they started to ask people, they were asking people to show the pictures from the war, so they were also going to non-Roma people to ask about that. O.Sz. : What do you think, what makes a young Roma person from disadvantaged circumstances to became active locally or on the national level in the civil society or in political groups? M.B. : I don’t know really, but I know one thing, that it was nice for them to realize that people believe in them. That they are honest and don`t mind if they fail. Because the most important thing that children can get from an organization and social workers is that they can believe in themselves. For example, we were about to prepare for the 2nd of August. And some people were telling me that we are crazy, Roma youngsters don`t do voluntary work, and we are wasting time. I was arguing many times with some people about the youngsters, because I kept saying that I believe in them and I don`t care if they fail. I don`t care because if they fail it means that they were trying. But they did not fail. O.Sz. : If you could do something in the future regarding the Roma communities, what would you do? What is your ideal project that would really make a change? M.B. : I don’t know, the thing that I would like to do is to go back and to have money to continue the work. Because that organization is a good organization and they are doing a lot of good things. I don’t have an ideal project but I know more or less what I would like to do. I would like to continue the Jewish cemetery project, maybe I would change the approach of tutoring Marienka with the mathematics and definitely I would start to compare the Roma language with the Slovak language and English language, because Roma children make specific mistakes in English. This could help Roma children to learn English quicker, then educate and participate not only on very local level as well as do EVS.